GartnerBlade is the collaborative work of Danielle Blade & Stephen Gartner. Business partners since 1996, we combine our ideas, techniques and experiences to create original works of art in both hand blown, sculpted hot glass & lighting design. Introducing at the show new hand blown glass table lamps! 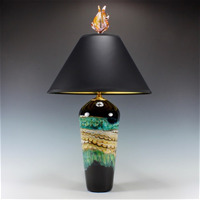 This hand-blown glass table lamp has a hot-sculpted glass finial and a handmade black paper shade with a golden metallic lining. Uses one 75-watt maximum bulb (not included). Lamp base is 9"dia. 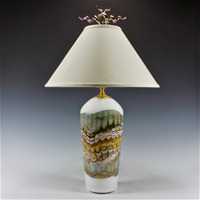 This hand-blown glass table lamp is adorned with a hot-sculpted glass finial and a handmade paper lampshade. Uses one 75-watt maximum bulb (not included). Lamp base is 7"dia. 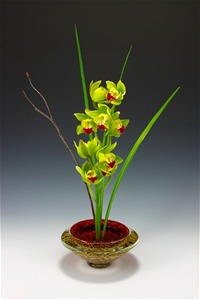 Composed in blown glass, this ikebana vase is both beautiful and functional and allow for great creativity. Brass Pin Frog is included. This larger size will accommodate a substantial arrangement of cut flowers and greenery. This LED pendant lamp is created from vibrant swirls and combinations of blown glass. 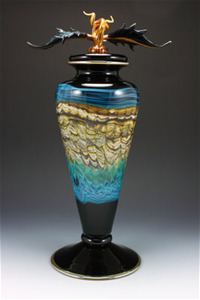 This blown glass vase features exquisite detailing, with a striking combination of colors. The top finial is hand sculpted under a flame.